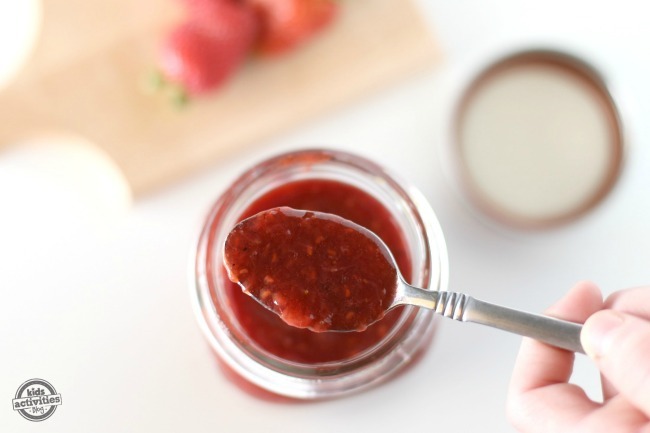 Summer is the best time to make homemade strawberry jelly! All the gardens are starting to have fresh delicious strawberries that are ready to pick so between strawberry pie and strawberry jelly – we’re using them everyday!! We make this jelly all summer and use it on our PB sandwiches, pancakes, and even as an ice cream topping. It’s so good and easy to make! There’s just something about making your own jelly’s that’s super satisfying. My Mom and I make all types of jelly’s and then can them to use during the winter months. It’s nice to have that fresh strawberry jelly taste even when it’s snowing outside because we were able to preserve some for the winter by canning. If you love to make homemade jellies and jams this recipe is going to be a new favorite, I mean with only three ingredients it’s so easy to make! We have an another fun recipe to make if you love recipes like this, our Blueberry BBQ Sauce is a new version to make if you love anything that’s BBQ! It’s so delicious and fun to make! Do you make your own jellies and jams? What’s your favorite recipe to make? I love to hear about different recipes and fruit mixtures!